The Malaysia International Trade and Exhibition Centre (MITEC) is the country’s largest exhibition centre with over 45,000 sqm of gross exhibition space. 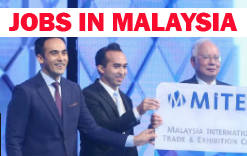 The first component and flagship of KL Metropolis, a city within a city where trade, commerce, living and transport converge over 75.5 acres of prime land development, MITEC is poised to be the first exhibition venue of choice in the Southeast Asia region. Interview will be conduct soon.